We are living in a period when sin is no longer given any meaning. It has become unimportant; it no longer counts. Today the existence of sin and Satan is being negated. 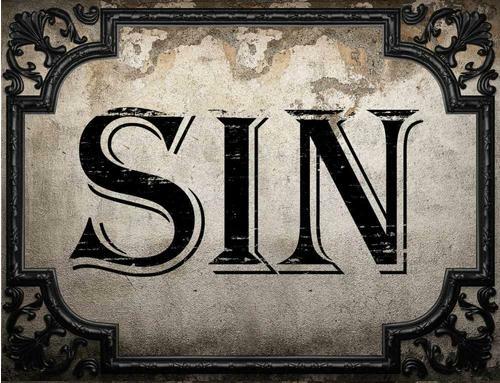 The concept of "sin" has been thrown out of modern man's vocabulary, because people say that sin does not exist at all. That is why they do not have to fight against it, but rather can give it room so that it can flourish. But the reality of our times is proof that Satan does exist, that sin is a satanic power and that the results of sin are misfortune and destruction. In criminality, the increasing suicide rate and drug addiction, we can see this reality and its disastrous consequences wherever we look. God is giving us today more visual instruction in the dreadful effects of sin than ever before. Today there is hardly anything else that we can turn our attention to other than sin. In our age it is especially true that the misfortune, destruction, criminality and decay of morality will only be hindered, if we hate sin and break with it. Above all we Christians have to take sin more seriously than ever before. For sin provokes judgment. And His Word tells us that judgment begins with the household of God, that is, with us. We Christians of today will be held especially responsible for our attitude towards sin, and will be judged according to much more severe standards, because we have received more, namely the clear directives of the will of God and at the same time the redemption from all our sins through our Lord Jesus Christ. Whenever we do not bring our sins to the cross of Jesus, confess them and turn away from them, they begin to work in our personal lives. We lose peace and joy, because our sin separates us from God. But even worse, our sin brings us a terrible harvest for all eternity. We will have to suffer for it, because it will be judged very severely in the next world. The Apostle Paul tells us that even Christians must appear before the judgment seat of Christ. This is what we as Catholics call the "Particular Judgement". For we must all appear before the judgment seat of Christ; that every one may receive the things done in his body, according as he hath done, whether it be good or evil. (2 Corinthians 5:10). The sensible ones today are those who measure their sins according to the Teachings of the Holy Church and the Holy Scriptures and fight a battle of faith against them in their personal lives. Whoever does this also has to take a stand against false brotherly love, which often tolerates sin. People see the main cause for all social ills and needs (for instance, slums, prisons, the morally depraved and drug addicts) in the social and political conditions, in the "structure of society". And they try to do something about them through "social activism". The facts, however, prove that it is not the social conditions that are at fault for the spreading of sin. We see that the increase of crime, all the misery of the personality and of the life of a nation, is found most in socially well-off countries like the United States, West Germany and Britain. Such an avalanche of addiction and criminality, which leads to misery and corruption, can only be caused by sin. Sin is spreading, because people do not want to confront it, let alone punish it. Instead they give it free reign. But whenever we make other people's sins seem harmless through false brotherly love, whenever we support this attitude, the reason is ultimately that we do not want to fight against our own sin, and to break with it. That means that we have gone over to the enemy's camp. For sin and Satan belong together. Jesus, who loves sinners so much, hates sin, because it is the ruin of the sinner. He has condemned it by taking it upon Himself for us, and showing us by His death that whoever sins actually deserves death. Jesus demands that we proceed categorically against sin. "Pluck out your eye!" Do not grant it any right to live, for, "For it is expedient for thee that one of thy members should perish, rather than that thy whole body be cast into hell." (Matthew 5:29). Time and again He tells us unmistakably that sin will be judged by God and that the unforgiven sin of the individual or nation will bring them misfortune here on earth and deliver them into the kingdom of darkness and horror after death. And this kingdom of hell which Jesus always talks about is a reality. Jesus' message was "Repent!" Turn away from your sinful ways! Jesus takes sin so seriously that He not only says that the Ten Commandments are completely binding for us, but He also deepens their meaning by attacking even lustful glances and angry words. He threatened punishment in hell, if we do not regret them and repent. For God had already said that the Ten Commandments would bring disaster, destruction and severe judgment to everyone who did not fulfil them. How seriously the apostles took sin can be seen in the New Testament epistles. They called it by name. The Apostle Paul could not only sing songs of praises for the forgiving and enduring love in I Corinthians 13, he could also quite soberly and earnestly demand that sinners be punished. To deliver such a one to Satan for the destruction of the flesh, that the spirit may be saved in the day of our Lord Jesus Christ. (I Corinthians 5:5). He wrote to Timothy, "Them that sin reprove before all: that the rest also may have fear." (I Timothy 5:20). Whoever does not want to become guilty, by going along with sin-perhaps due to a mistaken concept of brotherly love-has to take a stand against sin. For whoever really believes in Jesus Christ and loves Him has to hate what Jesus hates, and Jesus hates sin. He cannot make sin seem to be harmless or tolerate it or no longer call crime, addiction and moral depravity sin. According to the Holy Scriptures sin is to be punished, because it brings about dreadful things, because it makes us guilty and is the ruin of ourselves and our nation. If we Christians no longer take sin seriously, due to a misinterpretation of brotherly love, but rather seek to make it harmless and tolerate it, and perhaps even try to glorify it, like the representatives of the "new morality", we will pull others into sin also and cause them to stumble. Then we are struck by Jesus' severe verdict, "But he that shall scandalize one of these little ones that believe in me,(the young in faith) it were better for him that a millstone should be hanged about his neck, and that he should be drowned in the depth of the sea." (Matthew 18:6). Yes, such false "toleration" let's sin flourish. It deprives the individual of the opportunity to experience Jesus' forgiveness through repentance and sorrow about sin. It deprives him of a genuine healing of his spiritual needs through his Saviour. That is why our love for our neighbour is only genuine, if it is rooted in love for God. Scripture says, "In this we know that we love the children of God:(brotherly love in the true sense of the term), when we love God" (1 John 5:2). And the proof that we love God is that we "obey his commandments" (I John 5:2). But whoever obeys His commandments takes a stand against sin, which is from the devil. "He that committeth sin is of the devil" (1 John 3:8). It is our task to fight against Satan and sin so that lawlessness and destruction may not spread among us through our own fault, for "sin is iniquity, that is the transgression of the law" (1 John 3:4b). We must fight the proper battle of faith by drawing our attention to places in Scripture which show how God the Lord condemns the various sins and what He has to say about the dreadful effects and punishments-even to the point of hell-if we persist in them. Because God is Yea and Amen, and because everything has always happened as He said it would, this will also come to pass. "God is not mocked" (Galatians 6:7). What man sows through his sin he will harvest. That will determine where we spend eternity. And it is unforeseeable how many people we will pull along with us-either into eternal damnation or, because we have fought the good fight of faith, into eternal glory. When we read such truths in the Word of God, and are confronted by them, we are tempted to join His disciples in saying, "This saying is hard, and who can hear it?" (John 6:60). But then we have to listen to what Jesus answered them. "But Jesus, knowing in himself, that his disciples murmured at this, said to them: 'Doth this scandalize you? It is the spirit that quickeneth: the flesh profiteth nothing. The words that I have spoken to you, are spirit and life.'" (John 6:61,63). Because Jesus' words are spirit and life, they are not hard. If we believe them, they will free us and make us happy. Is there any grace more amazing than the offer of complete redemption by someone who is by nature a Redeemer, in spite of our guilt-laden past, in spite of massive bondages to sin, in spite of the hardness of our hearts, in spite of our inveterate, hereditary disposition? Did not Jesus Himself say, "If therefore the son shall make you free, you shall be free indeed." (John 8: 36)? Because God is Yea and Amen, it is true that if we take His words about sin seriously and open ourselves to judgment here, we will experience the power of His redemption and the reality of His release, which will save us from eternal punishment. Could there be any price too high to pay for His redemption in us during this short life? After all, the affliction is but slight and momentary. Will it not be followed by an eternity where we are even to be crowned as overcomers for this short battle of faith? A wise man once said that our earthly life in comparison with eternity is like the flight of a bird through a room. It flies in one window and out the next. Its real life is spent outside. And so our time on earth is but a passing moment in comparison with eternity. And why should we spend this moment trying to spare ourselves and not fight? Yet Satan suggests that we do this. For the moment of this life he offers us permission to persist undisturbed in our sin. He uses all possible methods to soothe our consciences, by trying to get us to consider ourselves saved through "cheap grace". However, we will be shocked when our eyes are opened in the other world to see how far away we are from Jesus. Let us not belong to those who reject as a "hard saying" Jesus' precious offer to redeem us from all our sins and let us not murmur against His conditions. Knowing that some had this attitude, Jesus said: "There are some of you that believe not" (John 6:64). Jesus has stretched out His hand to us and offered us eternal redemption. Who would not take His hand and be willing to pay any price to reach the highest goal that Jesus wants us to reach: Life eternally with Him.